There does not exist a generally accepted definition for the notion of complex systems in science, but it is a common belief that complex systems show features that cannot be explained by just looking at their constituents. Thus, a complex system normally involves interaction of subunits, and depending on the time scales, the propagation speed of information may become relevant for the dynamics. Therefore, it has been recognized nowadays that time delay may play a vital role in understanding complex behaviour. The new era of complexity science faces two challenges, namely dealing with the non-trivial topology of interacting subunits and the challenge caused by time delay, with the associated dynamics taking place in infinite-dimensional phase spaces. 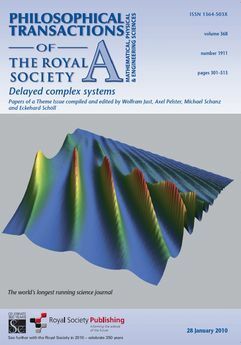 In the past, the subject of time-delay dynamics has been considered as a specialist topic so that only relatively few researchers were attracted. Within the last 15 years, research activities have considerably increased as many new applications have emerged in different areas, such as electronic engineering, controlling chaos, laser physics or neuroscience. Dynamics with time delay is going to play a vital role in new emerging fields of science and technology, for instance, because the speed of modern data processing does not allow finite propagation times of signals to be neglected any more. In addition, there are striking analogies between lasers and neural systems, in both of which delay effects are abundant. It is an intriguing feature of time delay that the phase space of any ordinary differential equation subjected to delay becomes infinite-dimensional. Hence, even simple equations of motion are able to produce extremely complex behaviour and bifurcation scenarios. Time delay has two complementary, counterintuitive and almost contradicting facets. On the one hand, delay is able to induce instabilities, bifurcations of periodic and more complicated orbits, multi-stability and chaotic motion. On the other hand, delay can suppress instabilities, stabilize unstable stationary or periodic states and may control complex chaotic dynamics. The recently held workshop on Delayed complex systems—from 5–9 October at the Max Planck Institute for the Physics of Complex Systems, Dresden, Germany—provided a forum for such topics. We took this opportunity to assemble a list of world-leading experts that now enables us to present an overview of the state of art in this field. The theme issue covers both applications and experiments, as well as mathematical foundations. The individual contributions summarize recent research results, but also address a broader context. Thus, the presentation is kept accessible for a large audience. The 12 articles cover all aspects of delay dynamics, ranging from control and stability, synchronization and numerical approximations, with applications in laser systems, neural science and engineering. The first contribution by Kestutis Pyragas and Tatjana Pyragien˙e addresses the issue of how to use time delay for the purpose of forecasting and to optimize the prediction horizon using dynamical-systems theory. The following five contributions are devoted to various aspects of synchronization and intermittency in time-delayed dynamical systems. The work by Bernold Fiedler et al. studies the synchronization of coupled oscillators by time-delayed feedback in a rigorous way. Thomas Murphy and collaborators give an overview of experimental strategies on synchronization of coupled optical elements. The contribution of Jordi Tiana Alsina et al. extends such an analysis to quantify the degree of synchronization in coupled semiconductor lasers using the concepts of symbolic dynamics. Synchronization of units with time delay can be efficiently used to establish a secure public key communication protocol, and the contribution by Wolfgang Kinzel and co-workers explains the fundamental ideas of such a concept. Finally, the article by Sebastian Brandstetter et al. provides a comprehensive overview of coupled FitzHugh–Nagumo systems, with a special emphasis on the effect of coloured noise and time-delayed feedback. The second half of the theme issue extends the scope to problems in digital engineering, the impact of imperfections and stochastic forces, as well as to biological systems. The contribution by Jason Boulet et al. addresses the problem of postural dynamics and identifies a critical time scale for the delay. The following two contributions study neural network models. The work by Gabor Orosz and co-workers describes how to use time-delayed feedback to regulate the behaviour of biological networks, and the article by Jérémie Lefebvre et al. presents a bifurcation analysis for a neural-network model of the sensory system. The work by Tamas Insperger and collaborators extends the focus of this issue to the fundamental aspects of control in engineering, in particular, the influence of digital delay on control performance. The penultimate contribution by Thomas Erneux and co-workers applies asymptotic methods to investigate front propagation in reaction–diffusion systems subjected to delay, and thus nicely supplements the previous studies on the FitzHugh–Nagumo model. We conclude this issue with a study on the emergence of chaos in digital circuits. Hugo L. D. de S. Cavalcante et al. discuss the mechanisms for generating chaotic motion in Boolean networks. We think this interdisciplinary theme issue may stimulate future developments and will encourage new interactions between different lines of research within this rapidly expanding vibrant field of delayed complex systems.